This short-range Hydrion Brilliant pH Paper provides excellent color separation in the acid range and offers clear bright single color matches at every .5 interval from pH 0.0-6.0. 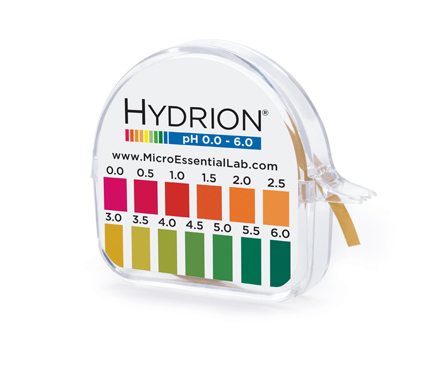 As a safety precaution, an unknown solution should be measured for its pH value. If it is found to be too acidic, the solution may be dangerous to handle, or may have special disposal requirements. Each carton contains 10 kits, each consisting of a 15-foot roll of test paper and matching color chart. Provides for approximately 1000 tests.